Though it comes with terrific performances, Lee Blessing’s Cold War two-hander is more talk than walk. “If mankind hated war, there would be millions of us and only two soldiers,” says the feisty Soviet arms negotiator to her formal U.S. counterpart. The quippy remark, unassailable but naggingly reductive, is characteristic of Lee Blessing’s 1986 two-hander. The play was inspired by real events: In 1982, American Paul Nitze and Russian Yuli A. Kvitsinsky left the official negotiating table in Geneva, Switzerland, for “a walk in the woods” where the two hammered out a sweeping proposal far beyond what was authorized by their respective governments. Like the figures they were inspired by, the two characters in this fictionalized encounter were written as male. But with Blessing’s blessing, Bowling’s production casts the Soviet negotiator as a woman; given Brooks’s masterful performance, it’s hard to imagine it any other way. Her Anya Botvinnik (née Andrei) makes feminine wiles a major part of her negotiating package, subtly cajoling and flirting with Parkes’s stuffy John Honeyman. 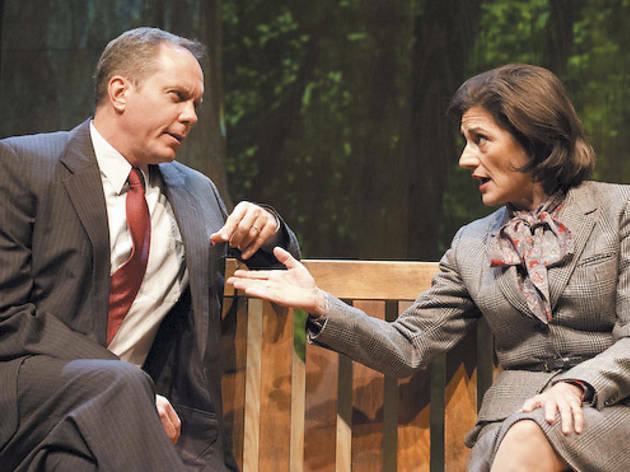 Both performances are skillful and nuanced, with Parkes’s Honeyman warming to Anya’s digressions even as he grows disillusioned with his assignment and the unlikelihood of a real nuclear-disarmament deal. 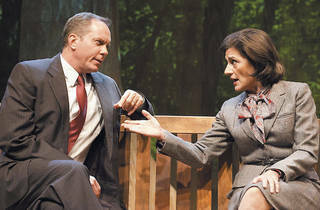 But Blessing’s play remains both simplistic and static, with the two characters endlessly circling a park bench. Jacqueline Firkins’s seasonal costumes and Mike Tutaj’s vegetative video projections try futilely to infuse the play with some motion. One wonders if it had more import when the Cold War was still present tense.